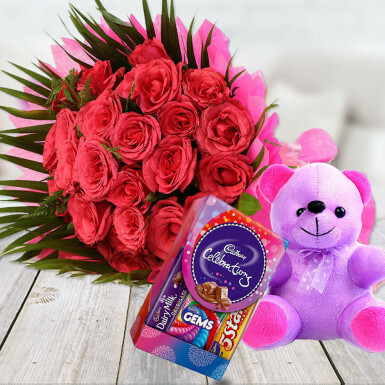 Winni offers you a charming combo of 25 pink roses, a delicious box of chocolates and a 6 inch teddy bear. The awesome combination of flowers, chocolates and teddy bear makes the perfect gift for every occasion. Be it, birthday, anniversary, rose day, promise day, valentine’s day and many more occasions. Pink roses signify gratitude, admiration and love. To shower love and affection on your special one then you can gift this delightful combo. This gift hamper is just the perfect one to make your beloved happy. So, go ahead and place your order now.